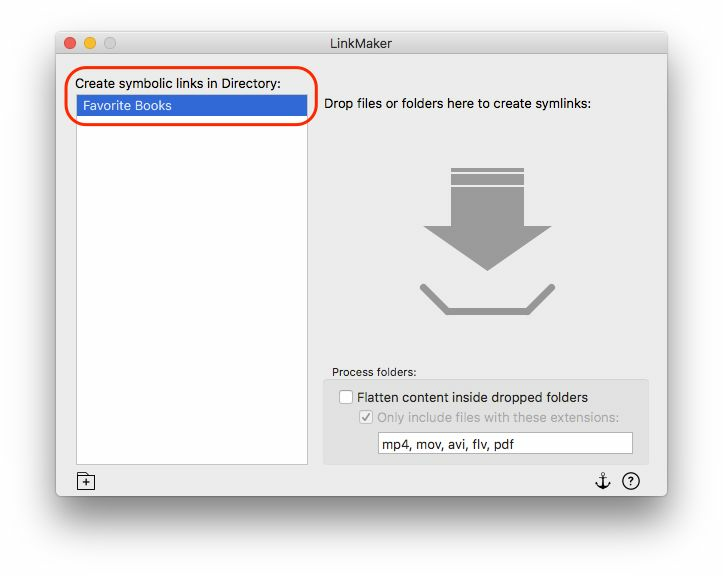 This manual has instructions for how to use LinkMaker (version 1.1) to create shortcuts to files and folders on Mac OS X. Essentially, to use LinkMaker, you select a directory in which you want to create the links, and then drag one or more files and folders onto the LinkMaker window to create those links. 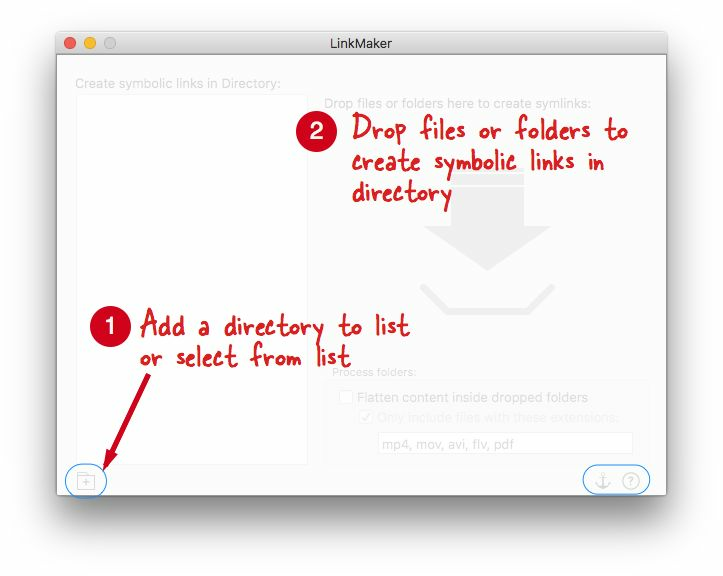 LinkMaker is available on the Mac App Store. 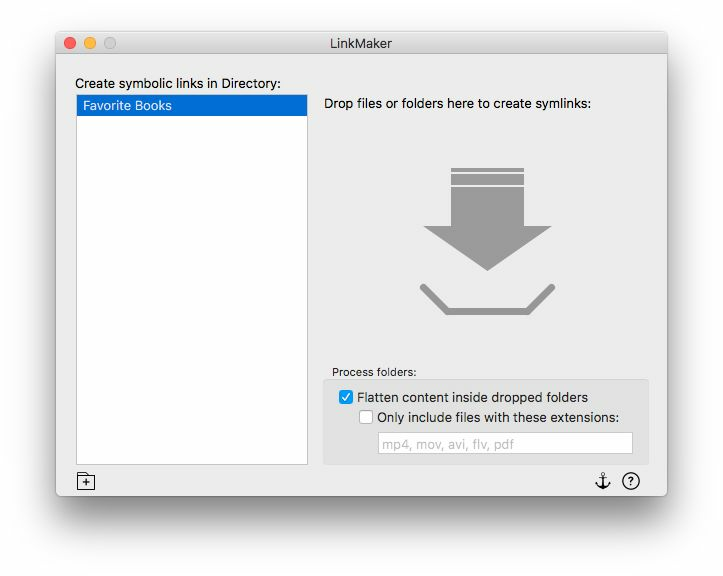 LinkMaker works on OS X 10.6.8 and later versions, including macOS X Sierra 10.12. When you run LinkMaker for the first time, you will see the following helpful overlay This is the Quick Help, and is available at any point by clicking on the "?" icon on the bottom right of the window. Click anywhere on the white overlay to dismiss it. In this illustrative example, we will create a directory to save links to books in PDF and EPUB format. These books are already organized in some folders on disk, and are managed by Calibre, and hence we don't want to duplicate the files or change the existing folder arrangement. 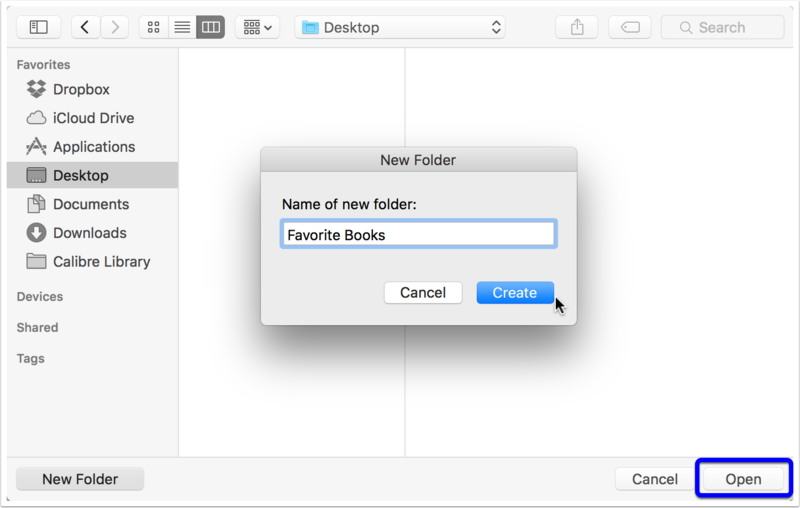 Use the "+" button on the bottom left to open the File Dialog, and in the File Open dialog, use the "New Folder" button on the bottom left to create a new directory "Favorite Books". Then select the directory and choose "Open". Ensure that the "Favorite Books" directory is selected in the left pane of LinkMaker. Now, when we drag files and folders into the right pane, the links will be created in the "Favorite Books" directory. 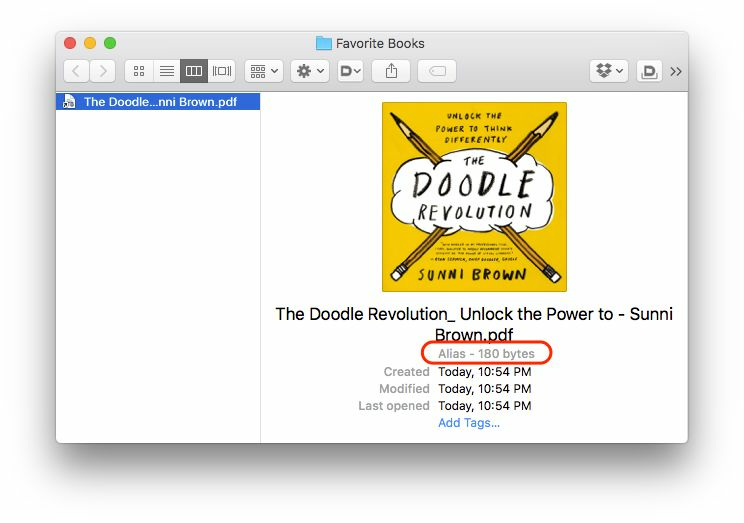 Open up Finder and locate the books you want to create links to. Drag them from Finder onto the LinkMaker window. In the example below, a PDF has been dragged from the Calibre-managed folders (which are organized by Author) to the LinkMaker window. Shortly after, you will see a bright green tick mark appear in the LinkMaker window to signify that links have been created in the specified directory, in this case "Favorite Books". The newly created link is only a few bytes in size, compared to the original PDF which was 30MB+. In the Favorite Books directory, you can see the links created by LinkMaker. These links serve as proxies for the files, and are valuable when trying to collate a lot of content and organize it. For example, directories of such curated links can be transferred in bulk to your iOS device using PhoneView or your Android device using Android File Transfer. By default, links to folders are created just like links to files. However, you can switch on the option "Flatten content inside dropped folder(s)" in LinkMaker to change this behavior. Now, when you drop a folder, an identically named folder will be created in the Directory, and links to the contents of the dragged folder will be created. 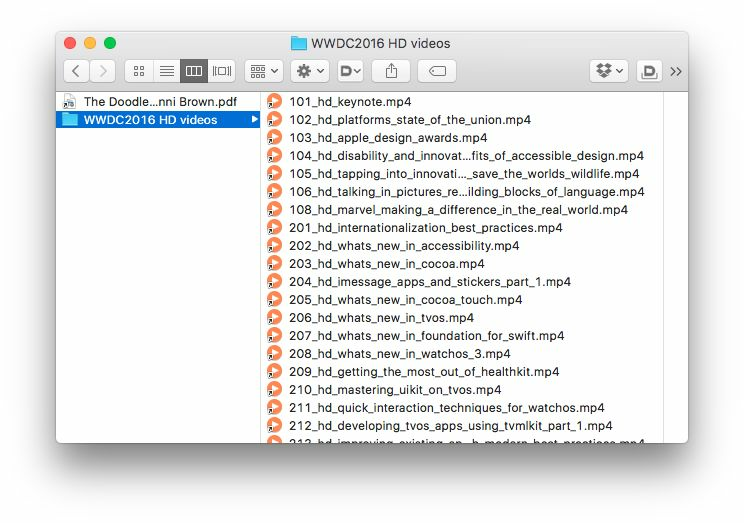 The figure below shows the results of dragging a "WWDC2016 HD videos" folder onto the LinkMaker window. Because the option to "Flatten content inside dropped folders" was enabled, a new folder is created inside the directory "Favorite Books" and links are created for the contents of the dragged folder. Another option in LinkMaker allows specifying which types of files in dragged folders should be linked to - and this is useful for example if the dragged folder contains files in multiple formats such as MP3 or TXT or RTF that you want to exclude from linking to. LinkMaker makes it easy to create shortcuts to files on your disk. In many cases, the folder structure is carefully managed by some app like Calibre or Dropbox/Google Drive/OneDrive or iTunes, and it's not prudent to mess around with the folder structure. In such cases, you can benefit from pulling out the links of interest and consolidating it into a easy to navigate directory structure using LinkMaker. Create quick links to important content in Dropbox, such as folders used by 3rd party apps to export files into your Dropbox. Build a file-based "playlist" of audio & video content such as episodes of iTunes podcasts, and drag this playlist into VLC or your iOS/Android device. 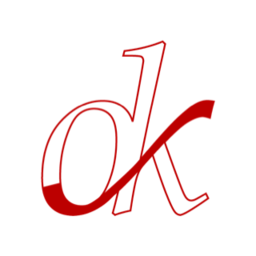 Build a list of PDF books you want to read & annotate over the coming week, pulled out from an existing folder structure where it makes more sense. Link into external USB drives and network shares, so you can quickly locate the files and folders on those drives while using a directory structure that makes sense to you.